Let’s talk about wrist pain. Why do we see wrist pain in the gym? First, let's be clear, the wrist is a vulnerable joint. It is a small joint full of small bones and all those little bones can get compressed together when we don't use the wrist properly. 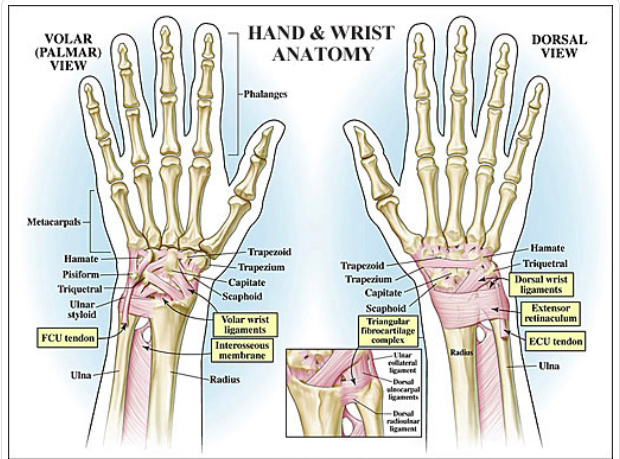 There are also many ligaments that join the wrist bones, tendons that link the forearm muscles to the fingers, and nerves that run through it all. Pain can arise from strain, irritation or compression of any of these structures. Finally, there are no muscles that directly stabilize the wrist. Support is all about the passive structures of the wrist (bones, ligaments, cartilage) and the active musculature of the forearm and hand. So, the wrist is easily victimized by a lack of strength in these areas, overuse of these muscles, or too much motion in an areas that is supposed to be more stable. If you are new to the sport, you have been faced with the front rack, handstands, lots of gripping of barbells and the pull-up rig, kettlebell swings, rope climbs, rowing, push-ups, burpees ... the list goes on. All of these movements involve the wrist. They are new and unpracticed movements and perhaps even weak at this point. As motor patterns and strength develop, these things get easier and potentially (hopefully) less painful. Overuse is the term used for repetitive micro-trauma over time. This is why your wrist might have seemed to start hurting one day for no particular reason. It is important to remember the concepts discussed in this blog piece on overuse injuries. In short, overuse injuries occur when the the tissue (muscle, tendon, ligament, bone) is unable to adapt to the demands placed upon it. Over time this causes microscopic injuries/micro-trauma to the tissues. It is this that causes pain and often it can be hard to put your finger on what happened. We may be attempting new movements, working fast and for long periods of time, all under fatigue and perhaps when we are unfocused on form. Weak arms, shoulders and core can contribute to this. If you’re not positioned properly and engaging the muscles of the body correctly to help you to hold your weight up or hold a bar overhead, you’re asking your wrists to work harder as you dump all that weight on them. In these cases you could be distracted, misaligned or simply weak. See solutions below for tips and tricks. More here on the importance of grip. Don’t ignore another source of the problem. The main example here is that your poor front rack is likely due to shoulder immobility and core instability. See this blog post for more on that!! Try stabilizing the joint with tape or wrist wraps. 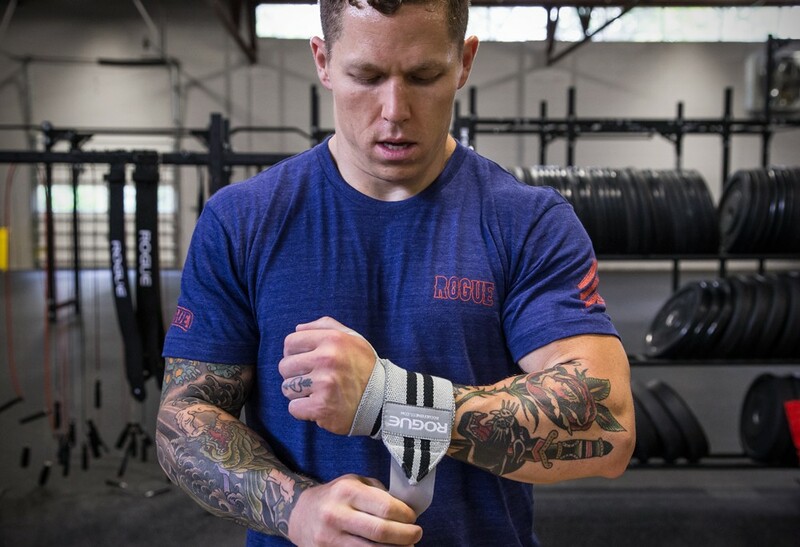 While wrist wraps will not completely prevent injury, they can add extra support to the joint. More on that here. Work on your wrist mobility and your stability in these new ranges. This is an area where everyone's needs will be different. But, in short you will need to work on strengthening and mobilizing these areas. Too often we see people just stretching their wrists, but perhaps the wrist is annoyed from being over-stretched. Think front-rack, push-ups, burpees and handstands. Maybe it needs strengthening. You can easily add strengthening with farmers carries, rowing (erg, ring row, bent over dumbbell or KB row), and weightbearing through the wrist in flexion. The wrist can take time to recover when its been injured so be mindful of staying relatively pain-free and ask your coaches for suggestions about modifications. There are lots of ways for you to stay in the game so don’t just stop coming to the gym!! In fact, upon your return after taking an extended break, you are then at risk for an injury to a different body area because you may be de-conditioned. Please feel free to contact Arrow Physical Therapy directly with questions or concerns about these topics.